There are several things I find hilarious and/or perplexing in this headline. 1) Picturing a robot ostrich. Ostriches are kind of ridiculous-looking on their own--I mean, their knees bend backwards and they're pretty much all leg. I'm not even sure how you would run if your knees bent backwards, now that I think about it, but ostriches defy the odds. They also have crazy eyes (see above), so I'm pretty sure they'd go AWOL on you in a quick minute. So I think it's safe to say a mechanical ostrich would have to be just plain scary. Think of the increased ability to destroy. The increased force (due to being composed entirely of metal) combined with the sheer insanity of a regular ostrich is enough to make me run the other way. Which brings me to my next point. 2) "Probably" outrun you. I like that the writer of this article doesn't want to underestimate your ability to run faster than an ostrich, so they get a "probably" in there just to cover the bases. I also like picturing someone racing a robot ostrich. It's just good fun. In what scenario would you even need to outrun an ostrich? 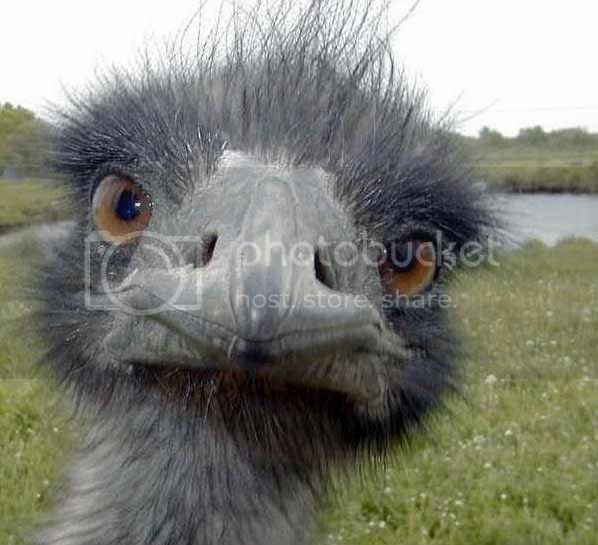 Though, given the aforementioned crazy eyes, I can see how something seemingly ordinary could go south pretty quickly-- for instance, if you and the ostrich were having a pleasant time enjoying each other's company, and suddenly you accidentally "look at him wrong" and he turns on you. I suppose then you would have to outrun him. I don't want to know what happens when an angry ostrich catches up with you. 3) Why? Why are we spending valuable time and money developing this technology? Does anyone really need a robot ostrich? Don't get me wrong. If they set up a robot-ostrich-riding booth at a fair or something, I'd totally get in line. (Who wouldn't?) But I'm sure that's hardly enough reason to get someone to invest in Robostrich. Yep. I'm calling it Robostrich. I'm pretty sure I'm just going to skim the rest of this article because imagining the possibilities is always more fun than whatever the actual story is. If you have any proposed uses for Robostrich, please feel free to share.